Format: 9 Ball. 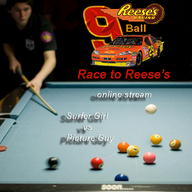 Reese’s Cup moving from head string along the diamonds, left side for the picture guy right side for the surfer girl. First one to make it to the foot string takes the Reese’s Cup. Oh confusing? Simply said 9 ahead wins. The pressure to win will be immense, as both participants are on low carb diet. Oh and the Reeses is very, very special to both of the participants… Participants are not allowed to obtain and consume any other Reese’s Cups before the match or after, besides the one that has been played for. No sharking allowed.